Edward Curtis used the stories he collected and ceremonies he witnessed while completing The North American Indian to create several fictional accounts of American Indian life before the coming of white men. 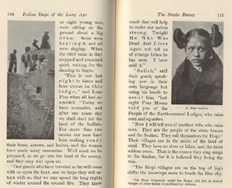 While these books were written to raise money to continue his project, they, like the articles Curtis wrote for Scribner's Magazine, were also meant to give a popular audience a fuller picture of the complexity and beauty of American Indian life and culture. While we do not know exactly how large his popular audience was, a review of the books in The New York times at least suggests that they generated publicity. 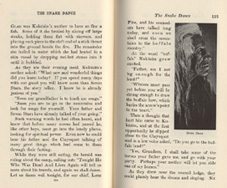 Like Curtis's motion picture, his books were criticized for presenting a romanticized picture of pre-contact Native American culture. By focusing on a way of life that, as Curtis acknowledges, has passed, he neglects to address both the reasons why Native American traditions disappeared and the contemporary problems of Native American cultures. 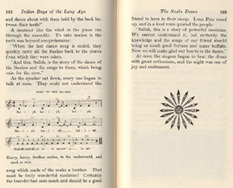 Below are images and text from three of the books that Curtis wrote ad collaborated on. As Curtis explains in his foreword, Indian Days of the Long Ago is both an attempt to show the diversity of American Indian cultures and the profundity of their religious and spiritual lives. 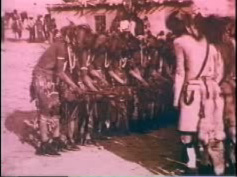 One of the ceremonies that Curtis focused on was the Hopi snake dance, which had become a great tourist attraction in the Southwest, and of which Curtis himself became an initiated priest. 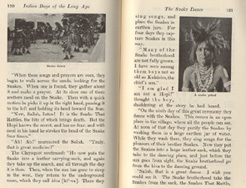 Click on the image to the right to see Curtis's motion picture footage of the snake dance, and on the images below to read the chapter on "The Snake Dance" in Indian Days of the Long Ago. 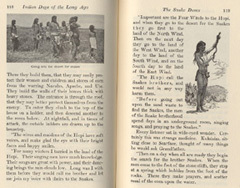 In the same year as Indian Days of the Long Ago, Curtis published In the Land of the Head-Hunters as a companion to his motion picture. The story, told "in the declamatory style of the tribal bards," is a love-story between two Kwakiutl Indians superimposed upon descriptions of the traditions of the tribe. As Curtis explains, both the book and the film are supposed to "give a glimpse of the primitive Americans as they lived in the Stone Age." While the film is entirely pre-contact, the book spends two chapters chronicling "The Coming of the White Men." Click on the title page and foreword to the right to see them at a higher resolution. In addition to his own books, Curtis collaborated with Marah Ellis Ryan, a popular sentimental novelist, to create Indian Love Letters. He contributed his photographs to illustrate her story, a series of love letters between two Native Americans. Click on the images to the left to view the title page and frontispiece from this novel at a higher resolution.